For the MS-DOS game, see Mega Man 3 (DOS). For the Game Boy game, see Mega Man III. 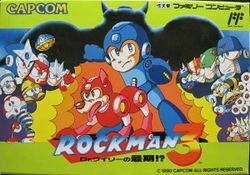 Mega Man 3, known as Rockman 3: Dr. Wily's Last Moment!? (ロックマン3 Dr.ワイリーの最期! ?, Rokkuman Surii Dokutaa Wairii no Saigo!??) (also translated as The End of Dr. Wiley, The Death of Dr. Wiley, or Dr. Wiley's Death) in Japan, is a platform game released for the NES in 1990. It marks the first introduction of Mega Man's canine companion, Rush. After being defeated in Mega Man 2, Dr. Wily is working with Dr. Light to bring peace to the world. They've started working on a giant robot called Gamma, but 8 crystals are needed to complete it. The 8 crystals are being protected by 8 new robot masters, so Mega Man is sent to defeat them and bring the crystals back to the lab. Part 3 in the Mega Man Classic series, Mega Man 3 once again pits Mega Man and his new canine companion Rush against Dr. Wily's latest creations. Featuring the new slide maneuver, as well as Rush and his three forms, Mega Man 3 is the pinnacle of the NES classic series. The gameplay of Mega Man 3 is almost identical to that of its predecessor, Mega Man 2. However, there are a few added features. Most notably is Rush, a mechanical dog that has three forms Mega Man can use to travel. The default form is Rush Coil, where Mega Man can jump on Rush's back for a spring-loaded boost. This is used for reaching ladders and ledges that Mega Man could normally not reach with just his jump. There is also the Rush Marine, where Rush transforms into a one-man marine transport. While in this form, Mega Man can route his buster through Rush and fire straight ahead at enemies. Third and the most popular of the three is the Rush Jet, where Rush transforms into a flat jet board that Mega Man can fly on. There are some stages where it is required to use this in order to proceed. There is also the new slide feature. Holding and pressing will cause Mega Man to slide for a moment. This is useful for reaching areas that Mega Man could normally not walk to. It is also useful for dodging enemy attacks. Many players use the slide technique to traverse the level as it is faster than walking. This page was last edited on 20 February 2018, at 06:54.